As more and more Christians realize there is a revolution in the earth for the church to be released from the captivity of legalism and law, the preachers of law and self righteousness are also becoming more ferocious than ever!! By reading through the websites of these ministries on the internet, it is clear that these ministries are also becoming more and more divisive, more determined to steal from believers the liberty that Jesus paid such a high price for, more clever in their arguments as so even trying to seduce and recapture those who for long periods have been soaring in the currents of grace. It is these preachers of law that love to quote scriptures from the gospels of Matthew, Mark, Luke and John out of context, forgetting that the crowd that Jesus was preaching to were the Jews! These Jews had been polluted with hundreds of years of preaching of the Mosaic Law of Moses, hearing day after day that their obedience of the Law will cause them to become righteous, their level of morality and good performance will earn them God’s acceptance and blessings. Now imagine centuries of “stiff necked-ness” later, and this is the crowd Jesus was preaching into. The Pharisees and Scribes also forsook many of God’s laws and replaced them with man-made rules and codes, which resulted in Judaism (Matt 15:1-9). They had over the centuries reduced the perfect Law of God to a standard that could be “kept”, but Jesus desired to show them that EVERYBODY falls short. Even if some claimed they had kept the Law their whole life, Jesus pointed out they still lacked in some other area. He wanted people to see that only by putting our faith in a Saviour (Him! ), could we ever be restored unto God, and by faith obtain grace, mercy and justification (Gal 3:5-9). If we read Jesus’ teachings through this perspective, we see why He always got so angry at the Pharisees (who thought God would accept them by their “holy” living), and why He showed such mercy and love to those who simply believed in Him and knew they couldn’t make it without Him. For example when the rich young ruler boasted in his own morality (Matt 19), claiming he had kept all the laws since he was young, Jesus showed him that he still fell short: he valued money more than heavenly treasures. 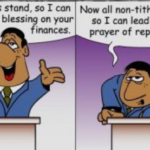 But now the modern day law preachers will take this scripture and tell God’s precious children (who have been freed from the law) that it is wrong for Christians to have lots of money, and that you can not go to heaven if you are rich. Remember the 10 Commandments which were engraved on stones? The 10 Commandments is called the ministry of death! This says the letter (the Law) kills! Therefore let us continue to contend for the freedom we have been called into, the glorious liberty of the new covenant! And beware of the modern day Pharisees who with their form of godliness (void of power) try to snare us into being performance driven, legalistic and continuously under pressure to try and live up to some standard. In Part 2 of this series we will look at why it’s actually impossible to live according to the Old Testament Law.